His Excellency Mr. Andrew Ford congratulated 18 trainees who have returned from three months training for a Certificate II in Community Services (Aged Care) in Fiji. 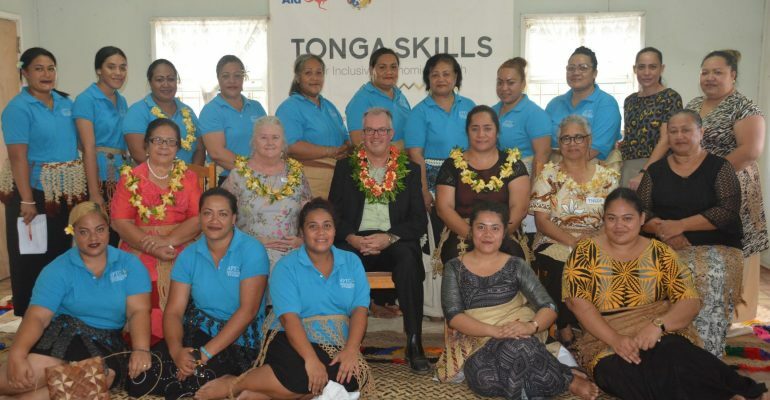 Tonga Skills – in partnership with the Australian Pacific Training Coalition (APTC), Tupou Tertiary Institute and Ma’a Fafine Moe Famili – welcomed the trainees to a reception at the Ma’a Fafine moe Famili Centre in Fasi moe Afi on Thursday, 17th January 2019. Two trainers from Tupou Tertiary Institute (TTI) also travelled to Suva to be mentored as trainee teachers for future aged care programs. Both trainers hold the Certificate III in Aged Care, and shadowed APTC trainers to learn the finer details of delivering and assessing aged care training for future delivery at TTI. The Tonga Government’s Disability and Aged Care Taskforce (part of the Social Protection and Disability Unit) under the Ministry of Internal Affairs, identified a need for training in caring for the aged for Tongan domestic purposes to support the elderly in their own homes. Ma’a Fafine moe Famili Director, Betty Blake thanked the High Commissioner and the Australian Government through Tonga Skills for funding this great initiative, enabling staff to be well trained in providing care services for the elderly. The internationally recognised Certificate II program also offers potential pathways to further training and employment opportunities in aged care in Tonga and overseas. The trainees left in September and returned in December 2018.